Tipping wait staff for food, hotels, taxis or other service-based industries isn’t the norm in China. While it is widely believed that Chinese consumers are generally unwilling to participate in the tipping culture, a wealth of online ‘tip’ services shows otherwise. In fact Chinese netizens commonly tip on a range of online services from literary works to live-streamed performances. Tipping online is called ‘da shang'(打赏), or ‘shang’ (赏) for short, a practice in ancient China that the upper class rewarded people with a lower social status. Da shang oftentimes happened during performances, when audiences would give gifts or cash to performers who belonged to one of the lowest social classes back then. In those days some types of performances, especially those performed on the street, didn’t charge admission but relied solely on tips voluntarily left by audiences. It is believed, though artists are not perceived as socially disadvantaged anymore, that explains why tipping artists and content creators is popular in China while other forms of tipping have gone by the wayside. Some tipping-enabled platforms even have charts ranking top virtual gift buyers, which gives them a social status boost in the virtual world, and in turn encourages more consumption. As online payment is becoming increasingly commonplace, tipping has become an important revenue stream for many online content and service providers. Some who count on contributor-generated content and services unsurprisingly take cuts from the tips. 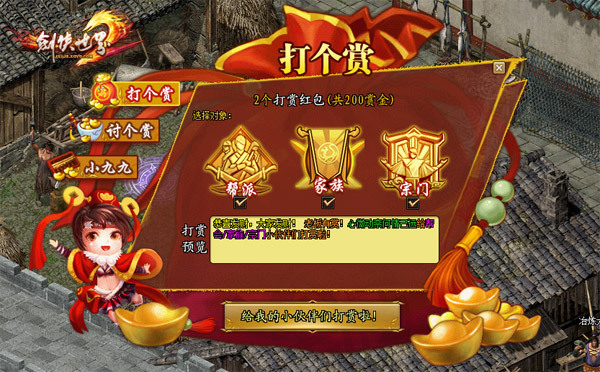 Most tipping norms and practices in the Chinese online world can be traced to the gaming world. Literature works published online also attract a large number of tips. In 2013, an author known as Meng Ru Shen Ji received a tip of 1.58 million yuan (more than $200,000 USD) from a 24-year-old business man. In 2014 a reader in his 60s gave a 1 million yuan tip to Tang Jia Shan Shao, a celebrated author. The price for a work originally published by Chinese online publishers, normally based on the number of Chinese characters, was generally lower than that for a print book. It was the tipping feature that helped top-grossing authors make tens of millions yuan in annual income. Now most Chinese online platforms that enable text, audio and video publishing have enabled tipping in the hope of generating more or less extra money for content creators or themselves, in addition to revenues from advertising or paid consumption. Alipay, the online payment service from Alibaba’s finance arm, and WeChat Payment, the mobile payment solution by Tencent, are among the most popular payment solutions adopted for giving tips. Sina’s blogging platform and Weibo, the leading Twitter-like micro-blogging service affiliated with Sina, added a tipping feature in 2014. In the period from June 2014 to June 2015 a total of more than 50 million yuan in tips went to Weibo post authors, according to Chen Fuyun, vice president of Weibo operations. WeChat, China’s most popular mobile messaging app, enables businesses or writers to publish articles through its official account system (aka. public account system). While the service has recently begun testing a paywall, a tipping feature was added in May 2015. WeChat allows for up to 256 yuan (US$40) for each tip. 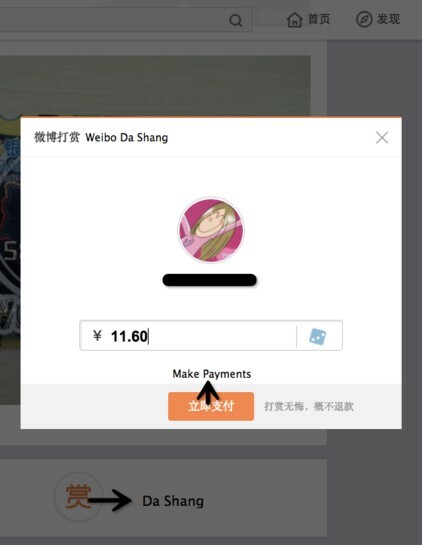 Transactions are processed by WeChat Payment, which takes only two clicks to make a payment within the app. 117 readers have tipped for this article. Alipay’s mobile app, which provides a variety of financial services and more recently added social features, began to allow users to tip for content shared onto its social sharing platform or on its live streaming channel in October 2015. It generates random tip amounts and no password is required for a transaction of less than one yuan. Travel diaries shared onto social travel service Mofenggo can also receive tips through Alipay or WeChat Payment. It’s not surprising that average entertainment industry fans are willing to spend more money to show their support than those of authors. Five hours after pop singer Hua Chenyu posted his new single on Weibo in August 2014, he received some 105,000 yuan through about 23,000 payments. The song download was sold at 2 yuan and tips were allowed. So the money paid as tips amounted to more than twice the song sales. A survey conducted by Tencent’s online media division at the end of 2015 shows that about 6 percent of a survey of more than 7000 paying music users tipped singers online. The whole industry of online interactive shows, which is huge in China, has been dependent on virtual gift buys from audiences for revenue generation. Kugou, one of the leading online music companies, saw some 70 percent of their total revenue come from virtual gift sales on their interactive video platform, according to a recent report by Jiemian.com, though its music streaming service is one of the biggest in China. 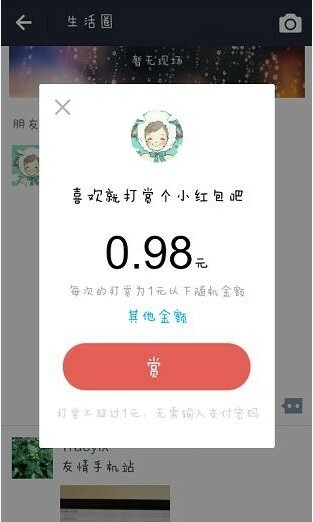 Will It Change the Tipping Culture in China? Digital tipping is so popular in China that a few startups focusing on it have emerged. With a plugin like this one WordPress bloggers can receive tips through WeChat or Alipay. Youshang, launched in August 2015, is dedicated to helping anyone collect tips on various online or offline occasions via QR code, which is widely accepted among Chinese mobile payment users. Both Alipay and WeChat Payment are equipped with QR code readers to process payments. WeChat can also read QR codes shared between users and complete transactions within the app. Now street performers don’t need a tip jar anymore but a QR code generated by a service like Youshang. A few services like Youshang are also encouraging restaurant wait staff to ask for tips through digital tip jars.